Gastric Analysis is performed here at the Tahoma Clinic to determine whether the stomach is functioning normally, if stomach function is inadequate there is a possibility that you are not absorbing vitamins, minerals, or certain proteins that your body needs. Gastric analysis has a long history in medicine, going back at least to the early nineteenth century. In most cases, the gastric contents were sampled through a slender tube that was passed into the stomach, then analyzed for content and pH. Although this technique provided useful information, it had obvious limitations in everyday practice. More modern techniques to evaluate stomach acid include the invasive nasal-gastric tube or standard endoscopic procedure, or the non-invasive Heidelberg Gastric Analysis. The latter has been available in various forms since the 1960s, and provides an accurate, patient-friendly test procedure easily done in a clinic setting. The Heidelberg Gastric Analysis features a supplement-sized capsule that is in reality an advanced micro-electronic diagnostic sensor that measures the pH of the stomach acid. Its findings are relayed by radio signal to a receiver which is positioned on top of the patient’s clothing, over the stomach area. 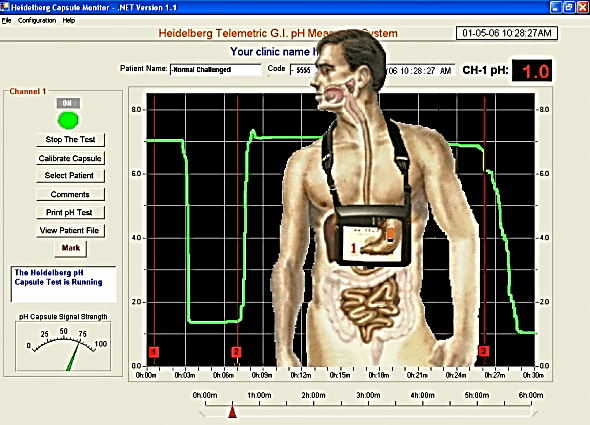 A computer and printer connected to the receiver record a continuous chart of gastric pH for as long as the capsule remains in the stomach (which can be several hours without discomfort). The capsule is tethered on a string, which can tickle the throat, but allows the capsule to remain in the correct position until the end of the test. In a typical gastric analysis, after swallowing the capsule, the individual being tested ingests a solution of bi-carbonate (baking soda/water), which stimulates the gastric juices to become alkaline. As the stomach lining continues to secrete Hydrochloric Acid (HCl), the pH gradually falls back into the acidic range. The rate at which the pH changes from alkaline back to acid, through a series of these bi-carbonate challenges, provides a very accurate measurement of the stomach’s ability to produce HCl. The Heidelberg test can accurately diagnose a patient who may have hypochlorhydria (low stomach acid), hyperchlorhydria (too much stomach acid), achlorhydria (no measureable stomach acid), or normal gastric function. After the test, the patient is provided water to drink, opening the throat while allowing the capsule to be gently lifted out by the attached tether. There is much confusion among medical professionals regarding the treatment of acid reflux, however, most conventional treatment is based on the supposition that reflux occurs because of an excess of stomach acid, rather than a deficit. Most physicians never check the actual acid secretion of the stomach, testing instead esophageal pH. However, this does not provide detailed information about the degree of acid secretion in the stomach, only confirms that acid has indeed refluxed into the esophagus. Detailed information about why suppressing stomach acid may be detrimental to long term health as well as contributing to reflux problems can be found in Dr. Jonathan V. Wright and Dr. Lane Lenard’s “Why Stomach Acid is Good For You”, available at online retailers, local bookstores and at the Tahoma Clinic Dispensary. Tahoma Clinic offers the Heidelberg Gastric Analysis to Tahoma Clinic patients, and also to patients referred by local doctors. If you are not a patient of Tahoma Clinic and would like to have this test, you may ask your doctor to refer you to our facility. For more information about how to become a patient of Tahoma Clinic, or to schedule a Heidelberg Gastric Analysis upon referral, please contact us. For more information about the lack of sufficient stomach acid and resulting conditions, please see Dr. Wright’s “Digestive Theory of Aging”.